This year, Texas A&M celebrates 10 years of a partnership with NASA, creating food that astronauts will eat in space. The National Center for Electron Beam Research on the Texas A&M Campus creates roughly 30 percent of the thermostabilized pouches consumed on space missions. The center, known by many as the E-Beam Center, also processes many other foods to make them safer, including mangoes and pet food. And the possibilities for translating this work into other valuable applications are nearly endless. Listen to the latest episode of Sound of the Spirit below via our player, or on Soundcloud. It was the early 1980s. Vickie Kloeris had recently finished her master’s degree in food science at Texas A&M. She moved to Houston to do quality assurance on patient meals at a hospital. Vickie liked what she was doing well enough, but then she met someone who worked for NASA’s Space Food Systems Lab… located just down the road from her at the Johnson Space Center. 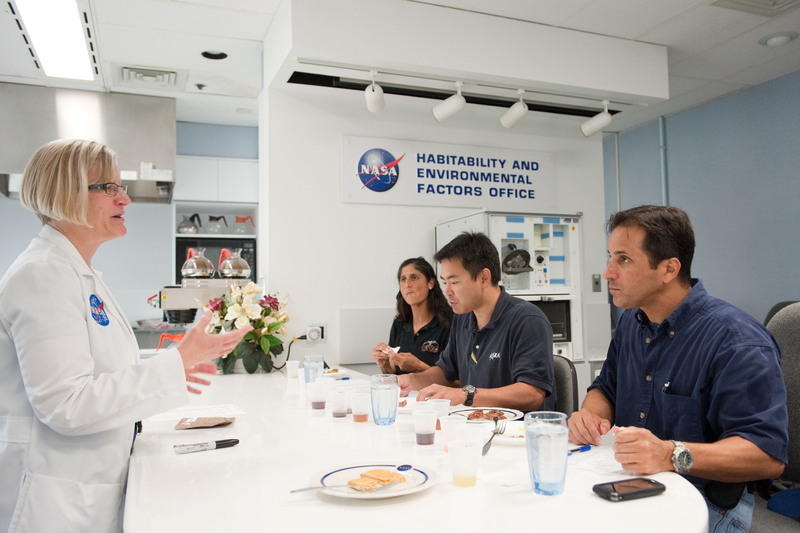 Vickie Kloeris, manager of the International Space Station (ISS) Food System, gives samples of space food to ISS crew members in the Space Food Systems Laboratory at the Johnson Space Center. VICKIE KLOERIS: It had never really occurred to me that food science would be part of the space program. I told the contractor/manager of the lab, I said, if you ever have an opening, call me first. And I interviewed and came here to work in August 1985, and I’ve been here working ever since. TANG COMMERCIAL: But the astronauts do some things you do. In space, they drank Tang. They mixed it like this in a zero-g pouch because with no gravity it would fly all over. But the thing about this space food—that incredible chocolate pudding cake—it’s made right here at Texas A&M. In a facility on west campus called the National Center for Electron Beam Research, or the e-Beam center as it’s known to the scientists who work there. The e-Beam center is part of Texas A&M AgriLife, and for the last 10 years, Texas A&M has partnered with the Johnson Space Center to produce the meals that astronauts eat in space. The recipes are custom designed by food scientists like Vickie Kloeris at the Johnson Space Center and then prepared in College Station. Dr. Suresh Pillai is the director of the center. SURESH PILLAI: About a third of the food items that are consumed in space are made on the Texas A&M University campus. In other words, around 70 menu items are made on campus. The e-beam center was an attractive spot for NASA to set up shop since it’s just a stone’s throw from Houston. In a big industrial kitchen, a small Texas A&M team creates the pouches of food that astronauts will one day eat in space. Sarah Parsons is a student in nutrition and food science who works in the center. SARA PARSONS: It's kind of weird to think about at first honestly because you’re making it and you see the process it goes through. It goes through the retort so then it’s sanitized and it’s kept stable. It's kind of strange to think that in three years someone may open it up to eat it. Ben O'Neil and Sara Parsons, both graduate students at Texas A&M, prepare food for the Johnson Space Center in the E-Beam center. Space food to be tasty and the menu has to have enough variation so that astronauts don’t go through what Kloeris calls “menu fatigue.” The food needs to be nutritionally balanced—low in salt and fat, and it needs to be safe to eat. The food is stored without refrigeration and must last for months or even years at a time. Astronauts aren’t the only people who benefit from the e-beam center. In fact, space food is just a fraction of the work that happens in this facility. On the other side of the building, Dr. Pillai and his team are researching ways “to heal, clean and feed the world.” Through a process called electron beam irradiation, Dr. Pillai is able to kill harmful bacteria and other organisms that compromise the safety of foods. SURESH PILLAI: These are all products that people are trying to evaluate. These are shrimp from Mexico that we are trying to extend the shelf life. As you can see they are sitting at room temperature and nothing is going wrong. There’s no growth or fungus or anything. The e-Beam center also processes regular shipments of mangoes from Mexico and Pakistan, which are treated for parasites at the facility. And some manufacturers of pet food who worry about salmonella have started to send their products to Dr. Pillai before they head to market. SURESH PILLAI: We even feed the dragons. Bearded dragons. Bearded dragon food. The turtle diet. The applications are nearly endless. 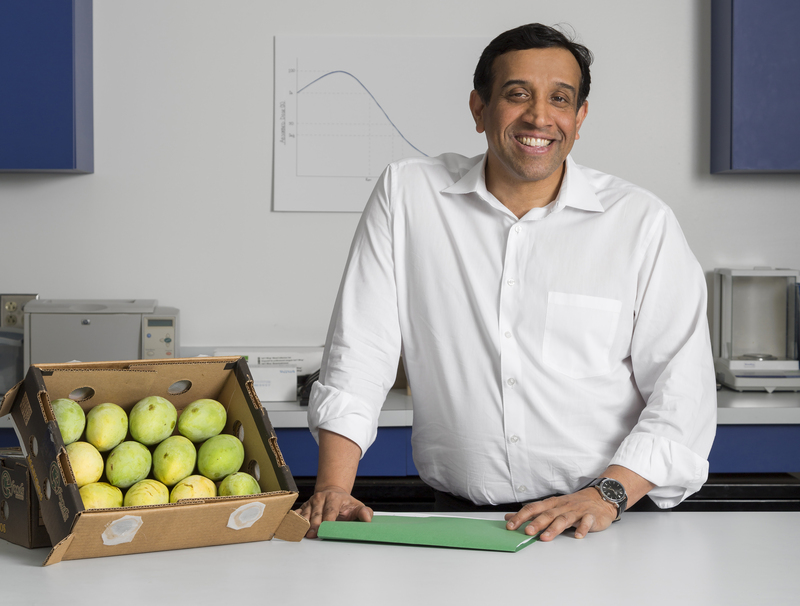 Dr. Pillai envisions a future for e-beam technology that could impact so much more than just mangoes and bearded dragons. The technology could serve countless people in disaster situations or in global health crises. Dr. Suresh Pillai is the director of The National Center for Electron Beam Research. SURESH PILLAI: The synergistic benefits or collateral benefits out of this could enable developing healthy vending machines, supplying food to hospitals, and also in situations where there are national emergencies where people need to be fed on products that have a long shelf life and are microbiologically safe. To continue to develop these and other applications Dr. Pillai says the E-beam center needs outside support. With financial assistance, more students like Sara Parsons can participate in E-beam research and gain hangs on experience…work that has a true impact on the state, nation, and the world. For more information on how to support The National Center for Electron Beam Research, visit give.am/supportEBeam or email info@txamfoundation.com. 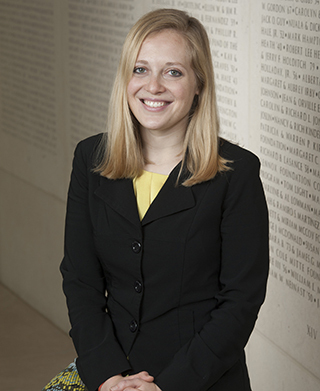 For the Texas A&M Foundation, I’m Monika Blackwell and this has been a production of the Sound of the Spirit. This episode was produced with help from Davis Land. For more episodes, check out the podcasts section of the Texas A&M Foundation website or subscribe to the Sound of the Spirit on iTunes.